Again, no particular order though Jenny Lewis would definitely be my album of the year and the Manics would probably be second. I ‘discovered’ the Rosanne Cash album due to her being interviewed on Radio 2 whilst I was having my haircut. Great times. Special shout-out for the King Creosote album, a project tied into the Commonwealth Games which I think does a better job of capturing the Scottish psyche than a million indy ref thinkpieces. I don’t think 1989 is as good as Red – it properly goes off the boil in its second half – but its high points are high enough for it to be included here. Particularly the bonus track New Romantics which, had it been released, would’ve been my single of the year. But Swift hates the internet so go illegally download it. Yet if she understands how to be viewed as an artist, Gaga lacks confidence in pop as an art form in itself, seeming unable to let a song breathe and instead overbearing it with very deliberate efforts to be seen as a ‘proper artist’. Throughout ARTPOP signifier upon signifier is piled on top of sometimes brilliant melodies, creating enough room for breathless readings of Gaga’s ‘art’ certainly, but failing on the more basic level as engaging pop music. One of her early statements was that ‘pop will never be low-brow’, a suggested understanding that the simple pleasures of pop songs like (for example) Carly Rae Jepsen’s Call Me Maybe or Gaga’s own Poker Face were a powerful and admirable art form in themselves. With ARTPOP, however, it instead seems that Gaga thinks pop needs to be smothered in the language and aesthetics of more traditional art forms in order to have ‘value’. This was quite an interesting one. My well-documented disdain for Lady Gaga led some friends to jokingly note that I couldn’t possibly be ‘objective’ when reviewing her new album. Yet such ‘objectivity’ surely doesn’t exist? We all approach music with our particular notions of what it is and what it should be; we particularly approach specific pop stars with these preconceptions. In the case of someone like Lady Gaga, whose personality is absolutely fundamental to her appeal, it’s disingenuous to pretend that you don’t have a particular view. Indeed, if you didn’t have one it would beg the question of why you were writing as a ‘critic’ in the first place. Sadly the decline of criticism and rise of marketing means that this isn’t viewed as particularly odd –it’s expected that a review will offer little more than bland statements as to whether you should spend your cash on the music in question. Here music is an extension of lifestyle rather than a cultural force with socio-political meaning. “Pop will never be low-brow”, indeed. FWIW, my personal journey with Gaga is peaks and troughs…her initial single run was dazzling, even if The Fame was largely dreck. As I note in this review however, The Fame Monster is an incredible record. Unfortunately its success, particularly that of Bad Romance, has derailed her entire career. It occurred to me while reading these thoughts on One Direction and fandom from Lucy Robinson that one of the greatest aspects of Springsteen & I (which I saw last night) is that it openly celebrates unadulterated fandom from the kind of music listener who is commonly presented as a ‘snob’ these days. Bruce Springsteen is pretty much the archetypal ‘old man with a guitar’ of our age, held up as emblematic of ‘rockism’ and beloved of the kind of people who could never listen to Ke$ha. Yet the fans in the film (ranging from kids through to pensioners) are as excitable, as enthusiastic and as devoted as the most hysterical One Directioner, It’s a very sweet and heart-warming depiction of the profound importance which music plays in the lives of those of us who’ve let the magic in; it’s also a moving tribute to the relationships which this can lead to. A mother proudly watches as her 10 year old son shows off the close-up photo of Bruce he managed to take after they both attended his concert; a couple reminisce about how they initially bonded over their mutual fandom and dance around their kitchen to a tinny stereo, lamenting that they’ve never been able to see Bruce live; a middle-aged woman explains how her first Bruce concert changed her, awakening a previously-dormant sexuality and a newfound appreciation for rock ‘n’ roll. In one of the loveliest moments a woman who could be a grandmother films herself alone in some woods (her first ever video, apparently) as she speaks about how Bruce is one of her oldest friends even though he’s never met her. What the film offers which a One Direction equivalent couldn’t possibly duplicate is an appreciation of the musical relationships which endure and which sustain us. 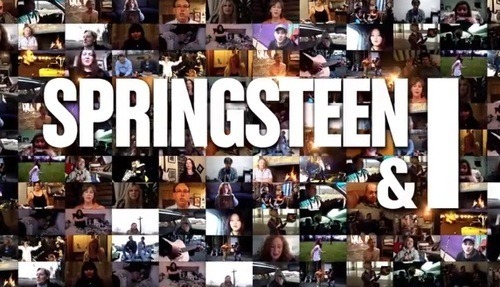 More than acting as a soundtrack to their lives, these people speak time and again of how Bruce’s songs are part of their being and how they offer the kind of intimacy which allows them to feel that they are seeing some kind of truth regarding life. One man speaks of how the lyrics are such that he feels he can smell Bruce’s coffee and share in Bruce’s failures and triumphs, an observation which reduces him to tears. A woman in her 20s speaks about her job and how Bruce’s music has helped her to accept that it’s ok to have a degree that she doesn’t use in her job as a truck-driver. It’s fandom but it’s also didactic and transformational. Bruce himself gets this in an after-credits scene where he meets some of the fans from the film. Asked what motivates him to get on stage every night, he explains simply that music changed his life for the better and he wants to be able to give that gift to other people. This is pretty much exactly what I meant when I wrote previously that caring about what they did was the most fundamental thing an artist could offer. The intense, ephemeral love for a short-lived pop act is something many of us experience and it’s great while it lasts but we’re kinda not supposed to acknowledge that it’s a temporary rush which probably has more to do with our own adolescent states than anything else. It’s seen as patronising to say that and preferable to pretend that we don’t ever change . Yet we do and the music which speaks to us evolves and changes in turn. If we’re lucky, the artists whom we love at 13 will change us, inspire us to check out more music, books etc, If we’re lucky, they’ll develop as we do and we’ll have a hell of a journey together. One Direction are clearly aimed at children and no doubt speak to their experiences but their music would be pretty useless at capturing the peaks and troughs of a 33-year old (unless it’s a particularly stunted one). Maybe they’ll progress, as (the far superior) Take That did but there’s nothing wrong with recognising that acts being loved by lots of kids isn’t a huge virtue in and of itself. What we rather should acknowledge is that our love for music doesn’t diminish with age. It’s no less ‘pure’ just because you have a life, responsibilities, problems and passions which take you away from it. Rather our relationship with music deepens and it permeates us in ways we couldn’t possibly begin to quantify or adequately describe. It’s a great thing and it should be celebrated. This emotional resonance transforms Bruce Springsteen’s The Last To Die, following in the footsteps of Always On My Mind and Where The Streets Have No Name as songs by iconic rock artists given the Pet Shop Boys treatment. Springsteen’s original is a weary and angry howl at the futility of the Iraq war but in this context, where the dance floors of New York in 1982 are never far from the mind, the chorus lines of “Who’ll be the last to die for a mistake/ Whose blood will spill, whose heart will break?” take on new implications. By the time you reach aforementioned Vocal it’s difficult not to think that many of the the people Tennant feels around him are the ones he has in mind when he sings Springsteen’s “We don’t measure the blood we’ve drawn anymore – we just stack the bodies outside the door”. It’s an astounding reinterpretation which takes an already great song to new heights. My review at usual place. Photos and videos from Bruce’s mighty gig at Wembley last night. Trite as it is to say, he truly managed the improbable task of making you forget that you were in a massive stadium. I was caught up in the music, dancing and singing with abandon – I have a brief clip of him performing ‘Hungry Heart’ which I haven’t uploaded as I was too busy jumping around to keep it focused on anything at all plus it has me very loudly screeching along. A recent Springsteen bio has the title “Bruce Springsteen and the Promise of Rock ‘n’ Roll’ which alludes to his evangelical power. I defy anyone to leave his gigs unconverted and not wishing to proselytize about the transcendent power of popular music done right. In an age where pop music is reduced to a consumer choice, where everything is ‘equal’ as long as someone is paying for it, Springsteen continues to be a standard bearer for putting the music front and centre. If much of this is catchy, however, you can’t help but miss the Noah And The Whale who could be emotionally devastating. Songs like All Through The Night, Lifetime and There Will Come A Time sound tailor-made to inspire pumping fists and mass sing-alongs and end up feeling like pastiches as a result. This isn’t helped by lyrics which lift heavily from the Springsteen book of growing up and getting out – One More Night (which sounds like it could come from Born In The USA) is even directed to a girl named Jennifer who got “married too young” and features a “kiss down by the river”. It may be a long time since Springsteen could call himself young but it’s difficult to understand why you wouldn’t just return to evergreen classics like Born To Run rather than listen to Noah And The Whale aping them, however well-executed these songs may be.